Did you know that Rta, can convert a six-yard into palazzo pants or a skirt? Well the renowned textile scholar and editor of book series - ‘Saris of India’ has many more sari secrets up her sleeve and will be showcasing how a sari can offer limitless possibilities. Incidentally, she can drape a sari in over 108 ways! 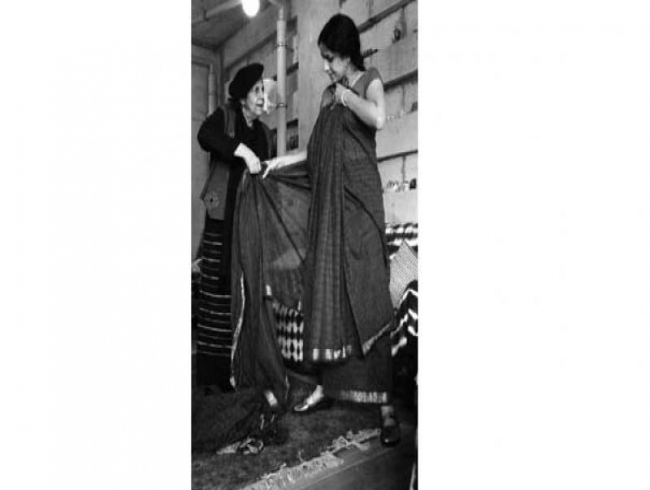 “The Saris of India project was initiated in 1984 at the instance of Sri Martand Singh while the first Vishwakarma Exhibition was being exhibited in India after having been shown at the festival of India in the UK. He thought that we should dig deeper into the sari as it could be developed for a contemporary market at least for the next fifty to hundred years. What started as a one year project, took many more, as there were many more sari varieties that could still be commissioned and were woven even after thirty or forty years,” says Rta. Basically research was the basis of the books that emerged and she also got involved with production. Most weavers were eager to replicate their traditional textile range which had virtually died out.
. Though the experience of searching, finding and attempting to revitalize within a contemporary context was exhilarating in itself, it left one with a feeling of standing on thin ice. Although it is a fast disappearing garment for everyday wear, the sari will survive as special occasion wear Indian women today prefer stitched garments and western wear of easy-to- maintain wash-and-wear fabrics. “We are working on hand spun, hand woven desi cotton varieties and silks for saris, stoles, fabrics, and home furnishing,” says Rta. The workshop will see her show an audio-visual that takes you on a tour through the 15 sari producing states of India and she will stop at four or five points to try out styles.